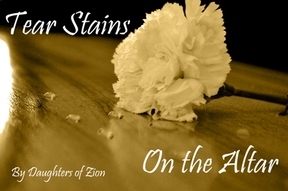 The Tear Stains on the Altar Album by the Daughters Of Zion was produced for Buildings for Babies as a free ministry tool or gift to those who make a donation of any size. To order this CD, click on the Donation button and enter a minimum amount of $2.95 (for S&H) and we'll send it to you ASAP. If you would like to make an additional donation, simply enter the amount you would like to contribute. For more info on Buildings for Babies click here. For more info on the CFBA Return to main site.